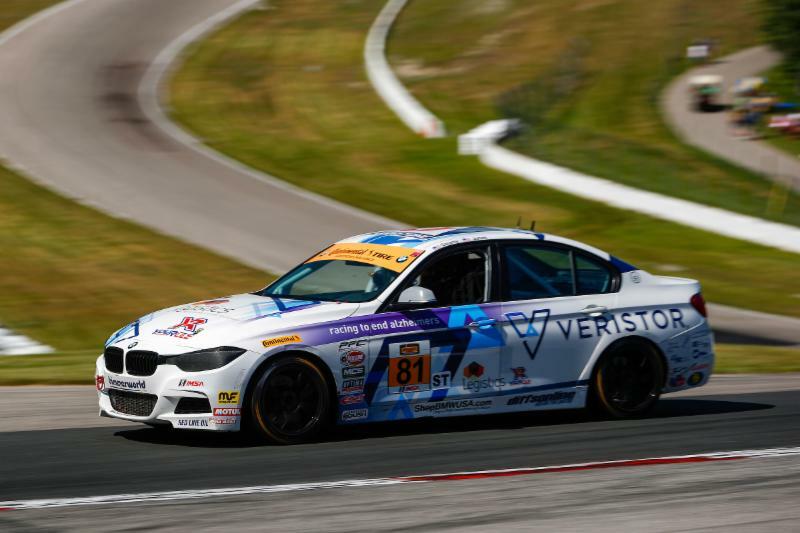 It was a Canadian driver in the IMSA Continental Tire SportsCar Challenge that crossed the finish line first in Saturday’s Canadian Tire Motorsport Park 120. Kyle Marcelli, who hails from Barrie, Ontario, piloted the No. 60 KohR Motorsports / Roush Performance Ford Mustang GT4 to its third win of its season in the Grand Sport (GS) class with co-driver Nate Stacy. Stacy – in just his seventh series start – qualified the car in fifth place and the team overcame a hitch in their strategy during a mid-race caution to hold on for the win. “My stint was quite stressful,” said Marcelli. “It was a miscommunication on the radio. When we got the full-course caution I was behind the safety car in Turn 8 and Dean Martin, our crew chief, asked me my opinion on if we should take fuel only. I was giving my answer through Turn 9 and as I released the radio button, he was yelling ‘Pit, pit, pit’ and I already missed the pit entry. The No. 60 Ford wound up running out of fuel on its way to the podium after the race. After entering the weekend third place in the GS championship standings, the victory jumps Marcelli and Stacy into the points lead as the 2018 Continental Tire Challenge season is halfway complete. No. 28 RS1 Porsche Cayman GT4 co-drivers Dillon Machavern and Spencer Pumpelly held the points lead since their class win in the season-opener at Daytona International Speedway in January, but a pit-lane penalty and subsequent mechanical issues in Saturday’s race dropped them to a 17th-place finish and third in the points. Holding second in the championship standings – seven points behind Marcelli and Stacy – is the No. 82 BimmerWorld Racing BMW M4 GT4 and co-drivers James Clay and Tyler Cooke, who finished eighth in class on Saturday. After scoring the pole position one week ago at Watkins Glen International and suffering damage in a mid-race incident that took the car out of contention for the win, the No. 80 AWA Ford Mustang GT4 of Martin Barkey and Brett Sandberg got redemption at CTMP with a runner-up finish, their best performance of the season. Preventing a Ford Mustang podium sweep was the No. 33 Winward Racing / HTP Motorsport Mercedes-AMG GT4 of Russell Ward and Damien Faulkner. The duo delivered Mercedes-AMG’s first podium result in the series after coming out on top of a hard-fought battle in the final minutes with Trent Hindman in the No. 7 VOLT Racing Ford Mustang GT4. Hindman and co-driver Alan Brynjolfsson finished fourth. Another Canadian entry in the Continental Tire Challenge field on Saturday afternoon also delivered in front of its home crowd, as Toronto-based Compass Racing dominated the TCR class for its fifth victory of the season. The victory came at the hands of Tom Long and Britt Casey, Jr. in the No. 77 Audi RS3 LMS, who also started from the pole for the second consecutive race. This is the third victory of the season for the pairing, which swept the two, four-hour endurance races on the Continental Tire Challenge calendar this season at Daytona and last weekend at Watkins Glen International. After entering the weekend second place in the TCR championship standings, the team’s win at CTMP moves Long and Casey, Jr. into the top spot ahead of teammates Rodrigo Sales and Kuno Wittmer in the No. 74 Compass Racing Audi. Wittmer and Sales had struggles of their own on Saturday, with an error during the team’s pit stop resulting in damage that sent the car to the paddock for 30 minutes. Inching closer to the top step of the podium, however, is the No. 54 JDC-Miller Motorsports Audi of Stephen Simpson and Michael Johnson, who finished a personal-best second place in the Canadian Tire Motorsport Park 120. 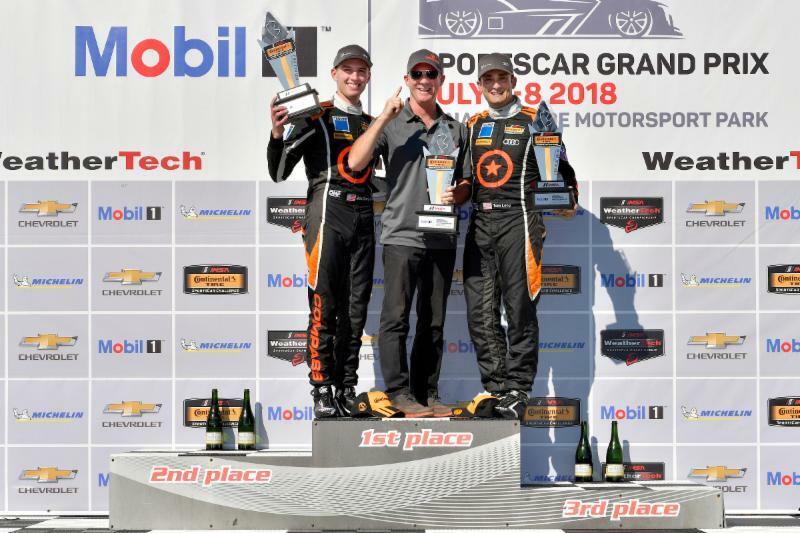 The result comes one week after the team took its first podium finish in the Continental Tire Challenge with a third-place run at Watkins Glen. Rounding out the TCR podium was another Compass Racing machine, the No. 75 of Pierre Kleinubing and Roy Block. This team also earned some redemption at CTMP after taking the pole at Watkins Glen, but involvement in a first-lap incident ended the car’s day. The third-place result ties the team’s best performance of the season after also taking third at Mid-Ohio Sports Car Course in May. Until the last 10 minutes of the Canadian Tire Motorsport Park 120, it looked as if the pole-sitting No. 81 BimmerWorld Racing BMW 328i of Devin Jones and Nick Galante was destined for a runner-up result in the Street Tuner (ST) class. However, luck was on their side today. With 10 minutes remaining in the two-hour race, the leading No. 52 MINI JCW of Mark Pombo and Colin Mullan – searching for its second consecutive victory – limped around track with damage to the left front of the car, but eventually succumbed and stopped on track. The car’s misfortunes yielded the way for Galante and Jones, sitting second at the time, for their second victory of the season. The No. 81 BMW’s win is doubly special as it puts Galante and Jones in the ST championship standings lead. In fact, all three winners on Saturday afternoon moved into their respective class points lead heading into the second half of the season. Rounding out the ST class podium was the No. 37 MINI JCW of Derek Jones and Nate Norenberg in second – their best finish of the season – and the No. 21 Bodymotion Racing Porsche Cayman of Max Faulkner and Jason Rabe. The IMSA Continental Tire SportsCar Challenge continues its summer stretch of racing in two weeks at Lime Rock Park for its sixth race of the season. The Lime Rock Park 120 is scheduled for Saturday, July 21 at 11:10 a.m. ET, ahead of the IMSA WeatherTech SportsCar Championship Northeast Grand Prix later that afternoon at 3:10 p.m. The race can be streamed live on IMSA.tv. A telecast of the Canadian Tire Motorsport Park 120 will air on Sunday, July 15 at 10:30 a.m. on FS1.